Avengers: Infinity War is a jam-packed movie set on multiple planets and spaceships. It moves at a rollicking pace too, flipping between superheroes young and old as they try to counter Thanos and the power of the mysterious Infinity Stones. Almost every scene required a tremendous amount of computer-generated visual effects. Marvel used a small army of external partners to complete the project, including a company based in London and San Francisco called Territory Studio. 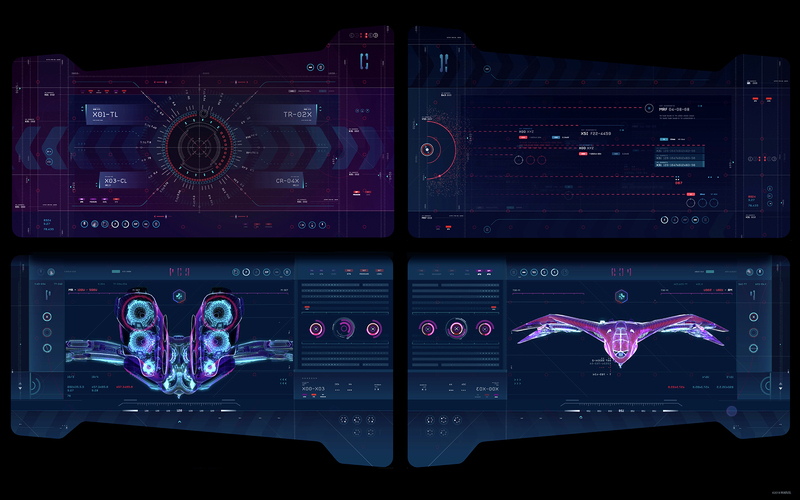 The independent team worked on 130 animated "screens" -- beautiful but entirely make-believe software -- for five different sets, including a new spaceship for the Guardians of the Galaxy. The vessel appears near the start of the movie when Thor, the god of thunder, is picked up by the comical and endearing Guardians. The scene opens with Peter "Star-Lord" Quill and the rest of his ragtag team singing along to "Rubberband Man" by the Spinners. All of the crew members are slumped in chairs with a slew of screens around them. These exotic control panels are the tip of Territory's contributions, which spanned tables, door air locks and a spherical escape pod. The company's mission was to reinvent the UI -- and by extension, the larger look and feel -- of the Guardians' moving home. It was a small piece of the movie but an important one to quickly convey how the group had been living since the end of Guardians of the Galaxy Vol. 2. All the screens have a blue, purple and green color palette, with the occasional dash of red and white to highlight important controls and information. They're clearly alien, designed by or for a race that didn't originate on Earth. Charles Wood, the production designer on Infinity War, asked the team to avoid modern interface conventions and, in particular, any form of symmetry. That's because the set itself was largely symmetrical; the Guardians sit in three rows of two and later gather around a single table at the center of the ship. Instead, Wood wanted everything to have a high level of abstraction and therefore seem otherworldly. That meant developing controls and visualizing data in a way that wouldn't look familiar or be easily understood by the viewer. The screens needed to provide some context, though, for the crew members and their roles aboard the ship. That meant making them readable -- not literally but visually -- at a glance. The six chairs, known collectively as the bridge, were all given distinct roles: pilot, co-pilot, a pair of engineers and gunners. The pilot and co-pilot have multiple screens for navigation, full of two- and three-dimensional maps. The gunners have screens for ammunition and aiming while the engineers have schematics and other graphics related to the ship's structural integrity. As the viewer, you can deduce what each screen is for but not necessarily how to control it. Territory also worked on screens for the vessel's galley. The set required a number of screens on either side of the room, three landscape displays in the table used to examine Thor, and all the door air lock controls. Finally, the team designed the control panels for the escape pod at the rear of the ship as well as a heads-up display that was added later in VFX. The colors supported the cooler tones and neutral lighting that directors Anthony and Joe Russo wanted in the scene. These decisions helped to ground the Guardians' appearance and elevate Thor as an awe-inspiring god. Territory has worked with Marvel before. In spring 2013, the Russo brothers were shooting Captain America: The Winter Soldier -- their first comic book movie, and one of the best to be produced as part of the Marvel Cinematic Universe (MCU). Territory wasn't on the project until the second unit started shooting a mid-credits scene in London. It was a prelude to Avengers: Age of Ultron that showed Baron von Strucker walking through a Hydra facility that is secretly analyzing Loki's Chitauri Scepter. "What we have is worth more than any of them ever knew," he snarled. At the last minute, Marvel realized that it needed some on-set graphics. The comic book juggernaut required screens that showed the weapon being analyzed on a cluster of nearby computers. Territory leaped at the chance, developing images with two virtual rings circling the scepter and its Infinity Stone. The concept was loosely based on photometry and 360-degree photography techniques that were being developed at the time. "We just did that because we thought it was a cool thing to do," Marti Romances, creative director of Territory Studio, said. Marvel liked it so much that it created two physical rings for the scepter on set. "That's one of the things that I'll remember all my life," Romances added. "Usually we're inspired by or reference the props that we see from the concept artist and the art directors while we're working with the art department. But in that case, we weren't working with the art department. We went there just to take care of that set, and it happened the other way around. The art department was inspired by our graphic." Clearly, Territory made an impression. The company was then hired to work on Guardians of the Galaxy, which turned a barely known group of superheroes into one of Marvel's most beloved properties. 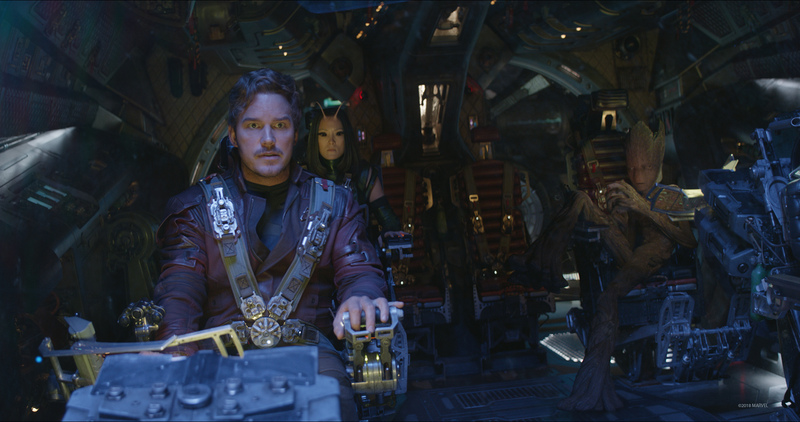 For this movie, Territory worked on the Milano, Quill's old but capable spaceship. It needed to reflect the hero and the '80s-inspired tone of the movie, which permeates the soundtrack, jokes and endless movie references. Territory, therefore, made the ship "a bit rough and ready" with plenty of video game and old aeronautical references. Everything was also dipped in red, orange and black to reflect the older era. The company also shaped the prison where the Guardians are briefly held, Ronin's Dark Aster ship, and the multicultural Exitar space port, among other sets. Romances was 25 at the time and became friendly with Alan Payne, one of the film's art directors. He introduced Territory to Wood, the production designer for Guardians and, to date, five other Marvel movies including Thor: The Dark World and Doctor Strange. "He is a busy man," Romances said. "He has lots of quick ideas that just fly by. You have to catch them before anyone else forgets about them." Territory assisted Wood on Avengers: Age of Ultron, which premiered nine months after Guardians. The screens spanned multiple sets, including Tony Stark's and Bruce Banner's personal laboratories, Baron von Strucker's fortress -- a nice continuation of the company's work on Captain America: The Winter Soldier -- and Doctor Cho's medical facility. Each locale required a different aesthetic that felt both futuristic and reflective of the individual character. Banner's computer, for instance, was colored teal -- an obvious nod to his monstrous alter ego -- and littered with references to advanced cellular and plant biology. Von Strucker, meanwhile, had a military-inspired UI based on his career in Hydra. During this period Territory was based solely in London. Two years ago, Romances moved to the US to start a companion studio on the West Coast. The company chose San Francisco rather than Los Angeles because staff wanted to be closer to Silicon Valley, where real technological innovation was taking place. Territory isn't a software developer -- it's not making apps like Microsoft or Google -- but its designs need to feel possible and believable. It uses the Bay Area, therefore, as a pool of evolving source material for its near-future tech. "We like to say that we bridge Hollywood with Silicon Valley," Romances said, "because it's important for us that when we're designing almost impossible things, and very futuristic things, for films that we are familiar with what's happening in real life. If we have a good understanding of how technology is evolving right now, it helps us connect the dots and be a bit more accurate when we are speculating on what could happen in a few years' time." The new office also meant Territory could set up a 24-hour pipeline. Paired with the London office, the two teams could work in tandem, developing screens through the day and then uploading them to a server so their compatriots could refine them further during the night. The company used this relay-race development process for some last-minute VFX work on The Fate of the Furious. "It was a good experiment," Romances said. "And I think it worked very well." All of this work prepared Territory for Avengers: Infinity War. With a new base of operations established, the team was well-positioned to help with any project in the US. Marvel, by coincidence, was planning to shoot Black Panther and Avengers: Infinity War simultaneously in Atlanta. Georgia has aggressive tax incentives for the entertainment industry, making its capital one of the most popular shooting destinations in the US. Territory staff members were thrilled, unsurprisingly, to be selected for Marvel's big crossover event, especially when they heard it would include a Guardians of the Galaxy set. For the first three or four months, Territory embedded itself with the Marvel crew in Atlanta, poring over concept art, scripts and partway-built sets. Immediately, it was clear that the Milano hadn't been repaired between Guardians of the Galaxy Vol. 2 and Avengers: Infinity War. Instead, the jokey crew would be piloting an all-new ship. "All of a sudden we found ourselves with a brief that was, OK, we have to reinvent what we did before," Romances recalled. "We have to do a new version of the spaceship. And it's going to be an upgraded spaceship." The creative director was able to walk through the art department and watch the larger production team as it 3D-printed parts of the vessel. The work was unfinished, but it helped Territory to conceptualize the ship, its history and the ways it might be operated. Developing the new screens wasn't easy, however. Territory assumed that Wood would want a design language similar to the original Guardians of the Galaxy film. Wood had requested a new color palette, but otherwise the crew thought it would be a continuation of their previous work. After all, it was the '80s references that made the heroes so different and recognizable from the rest of the Marvel cast. Territory took its old designs and "mashed them together" with elements inspired by the new ship. The mash-up echoed the company's composition, which included old artists -- people who had worked on the Milano -- and new employees with fresh ideas. It didn't work. Wood looked at their ideas and suggested a completely new approach. "He started asking us to keep it looser in terms of functionalities and buttons," Romances recalled. "He wanted it to be more abstract. He was always reminding us that these guys come from a different galaxy. They've seen things that we never will imagine." It was a difficult decision but one that eventually paid off. As Territory scrapped the buttons and dials inspired by '80s electronics, it realized that there was suddenly more space to play with. What might have been a small visualization, or widget, could suddenly take up the bulk of the display. In the beginning, Territory established some color rules: All the backgrounds were purple, the highlights were cyan and so on. But again, Wood told the team to be more experimental. He wanted a varied look with different combinations that fell within the same color range. "Wood pushed us to do these things," Romances said. "He took us out of our comfort zone. And we started being a bit looser in terms of how we distributed design elements across the different screens." The secrecy surrounding Avengers: Infinity War created some unique challenges. Marvel produced several fake scripts and shared different parts of those scripts with each department and third-party vendor. The idea, of course, was to limit and intentionally obfuscate any information that was leaked out to the press. "They were very careful," Romances said. It meant that many people working on the project didn't know what the "real" version looked like. Territory needed some idea of the larger story but was never sure if the ending was correct or how other scenes played out. The uncertainty was new to Territory and required a level of trust with Wood and the rest of the production staff who were approving its screens. There was an upside, however: The company could focus on its own contributions and forget about what was happening elsewhere. "It's really important that you are very focused," Romances said. "You do your best and do one thing without getting distracted by the rest." Once the graphics were finalized, they could be used on set during filming. Territory visited Atlanta "for months and months" to see how the movie was progressing and deal with any unexpected problems. 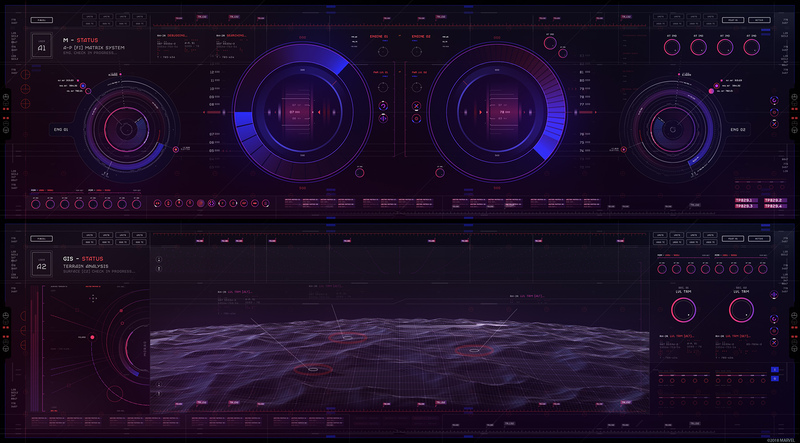 Territory, for instance, designed its make-believe software for old Chinese monitors that were used in the original Guardians of the Galaxy. Some of these screens, however, were damaged in transit from the UK, and those that did make it weren't bright enough on camera. Eventually, the decision was made to use iPhone 6 Plus screens instead. "It was great for us because then you could really see [our screens] through the camera," Romances said. Territory had to tweak some of its work to match the new displays. "That's why it's so important for us to be there," he added. "To be able to react, because we have to make sure that when they are ready to shoot, everything works perfectly. They're not going to wait for new graphics here and there. They have all these very expensive actors and actresses and all these riggers and lighters and camera operators and everything there for that moment. So we have to make sure everything works perfectly." The production, in many ways, mirrors the film and its colorful cast of characters, who were forced to split up and fight in separate corners of the universe. Territory was one of countless companies brought in to help with the project's stunning and seemingly endless visual effects. With limited information, the crew had to work on their sliver of the MCU and trust that everyone else was doing the same. If you look at reviews and the film's box office ratings, it would seem that everything came together perfectly. As for Avengers 4? Well, Infinity War and its sequel -- originally called Infinity War Part Two -- were shot back to back in 2017 and January 2018. You can probably guess whether Territory was involved in the second half -- for now, though, the company is sworn to secrecy. "It's been a ride," Romances said with a wry smile. Update: This article was modified after being published. Mentions of production codenames were removed for legal reasons. All images courtesy of Marvel/Territory Studio.